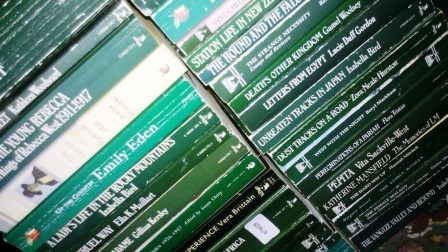 … I mentioned in passing, that now we knew my mother would be staying in nursing care, I could bring some of my boxes of books down from the attic, use the floor space in her room to sort them out, and then stack them against the wall so that they would be more accessible until I worked out a longer term solution. It was a maybe one day sort of comment, but that day when I was at work my fiance took it upon himself to bring down three boxes. The process has begun! I stacked books to keep against the wall and took books that I decided I could let go downstairs. The process went on over the next few evenings until all of the boxes were gone and the only books left in the attic were university and accountancy textbooks. And once I had started I decided that I had to do the job properly. I went through all of my upstairs storage boxes – some really useful and some virtually indestructible cardboard boxes – picking out a few books that could go and swapping books I thought I’d want to pick up soon with ones I was happy to put away for a while from the stacks. I did the bookcases too – not the Persephone and Virago bookcases, from which nothing can be spared, but all of the others. I now have six bags of books to be taken to charity shops and a pile stacked up that I’m offering on Green Metropolis and ReadItSwapIt. I manged to clear a shelf so I could move a number of old hardbacks from a corner bookcase upstairs to a prominent shelf downstairs. Now they sit between a shelf with dog books and some of my grandfather’s classics and another with childhood classics and family reference books. My collection of Virago non fiction still needs a home, and there are still a few books on my desk to be sorted out, but now my entire home library is within easy reach. All of that ate up my blogging time and a certain amount of my reading time for the last week or so, but this week I want to get back into my usual routine. What I need now is to rethink furnishings and have some proper bookshelves built in. But not yet. I’m not ready to change my mother’s home and poor Briar doesn’t like all of the upheaval. She was particulary unimpressed when she went to her bed in mother’s room and found a stack of Daphne Du Maurier VMCs rather too close. But I have made progress and I have a plan. One day …. I really need to do the same thing but it’s such an enormous task, I keep putting it off. Same here, but once you start I think you’ll find this is the sort of task that devops its own momentum. Great job! 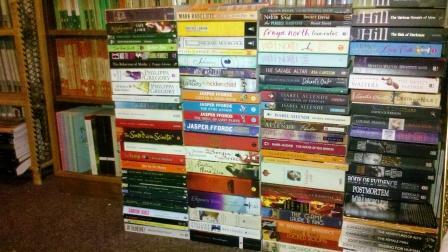 Funny, Booksnob has just posted that she has also had a clearout/tidy up of her books! Bank holidays are so useful like that! I can only think that there must be something in the air at the moment! I’ve been looking at the out-of-hand chaos here and thinking the same thing, Jane. However, an overly ambitious bout of weeding has left me slightly out of commission, so lugging books around will have to wait for a bit. I often look at this small study and fantasize about having the entire room done in built in shelves. I’m afraid it will just remain a fantasy. Good for you for getting at ‘er! Ouch – do be careful! Proper shelves are still some way in the future, and I’ll have to sacrifice something else, but books dogs and wool are my priorities in life now. Though not necessarily in that order. Hi. Don’t worry too much right now. 6 years down the line and I am only just sorting my mums books out!!! There is no rush! I completely agree though, that life events can completely change your reading habits – I used to read anything, but now I can’t read anything that I don’t learn something from. 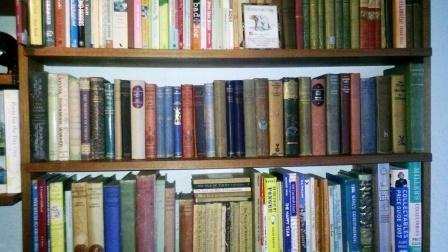 So its classics or non fiction in main……there is no rush. You may feel differently about a book to be given to charity in a few months time…… Take care and let me know if you do want a home for them…….I am always collecting!!!!! The advantage of putting books in an attic is that you are used to being separated and so it is easier to part with the ones I haven’t missed when I see them again. And I tend to get rid of the mainstream, easily gettable books and hang on the the old and obscure. I suspect reorganisation will be a job for life, because new books are still calling me. Wow! That was a mammoth task. Well done. I always manage to get side tracked when I am doing jobs of this kind. I tend to sit and dwell on the things I find that I had forgotten about. It was the other way round for me – thiswas the job that distracted me from so many other things I should have been doing! I love re-arranging books, and also re-discovering them. My books are constantly in motion, especially as I add new authors (or sometimes remove old ones). And I’m still weeding out books, mostly for the library sale – though almost every time I go, I find something else to bring home. Mine are going to have to be constantly in motion too, because books always lead me to other books and so many things I want to read are out of print. There must be something in the air as I was sorting as well over the last few days. Although I have not collected so many, I have been rather ruthless in the past and got rid of books I now want to read, thank goodness for libraries which I have rediscovered so I can revisit. 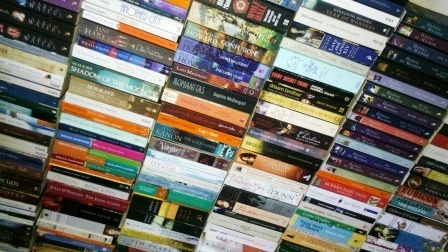 Trouble with sorting, there become more books to read afresh or again! My policy now is to order new books from the library and but later if I really want a copy to keep. I’ve rebought a few books I cleared out last time I move, but I think – I hope – I’ve got a clearer direction on what I want to read now, and more than enough books to read and reread to keep me occupied for a very long time. Just occurred to me that it might be the ideal task to occupy me when junior daughter has gone to uni in three weeks time and the emptying nest syndrome hits me! Now that sounds like a plan. My reorganisation was long overdue and I am so glad I finally got to it. Well done! I’ve got the same bug, but rather more limited space and no funds at the moment, so progress is miniscule. But I too have a plan! I’ve only just acquired the space and I still have to work out the funds. But hopefully we’ll both get there one day! One of the best housekeeping tasks there ever was, it’s so much fun to ‘play’ with books! I know what you mean about your taste in reading material changing. A bookcase in our spare room had all sorts of sale table finds and flash in the pan fiction, it looked so garish next to my middlebrow bookshelves. Needless to say there has been some weeding going on at my house as well. And poor Briar, missing your mum. It certainly is! Briar is getting used to her new routine, but she hates having changes made to her home. Which is reasonable, she’s lived here since she was 8 weeks old, its the centre of her world, and she’s never quite understood the importance of books. What a huge task, and well done for tackling it. But also very pleasurable to handle books and especially to find those old treasures from generations back in your family. Hope Briar is doing ok with it all. I finally had a bit of a cull of my fiction shelves that I’ve read, and am going to part with some that I don’t think I’d read again. I don’t find it easy though.